For the first time since Nigeria's maiden World Cup qualification in 1994, the Super Eagles' tournament preparations are serene and unperturbed. Ahead of the 2010 World Cup, for example, Nigeria's build-up was plagued by controversy. The most significant revolved around a last-minute change to their World Cup base camp, after newspaper reports back home described their chosen hotel as below standard. This was against the advice of FIFA and earned the NFF a $125,000 fine from world football's governing body. That was only one facet. There were also controversies around player selections and, in late February, Swede Lars Lagerback was appointed head coach as Amodu Shuaibu's replacement. 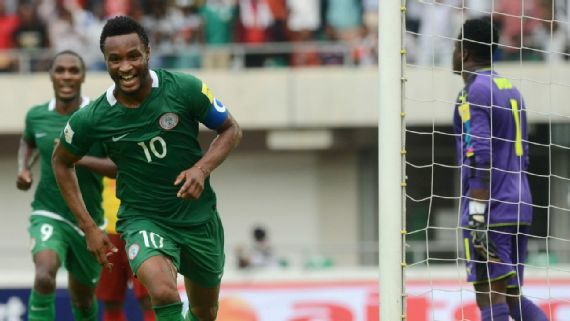 It was a similar story in 2014, when friction between the federation and coach Stephen Keshi, player selection issues and bonus disputes overshadowed tournament preparation and continued during the Eagles' campaign in Brazil. None of these issues are anything new to Nigerian football, where dissension and scandal appear to be the norm rather than the exception. However, for the first time since 1994, that cycle of controversy appears to have been broken. Not only has a World Cup training base been picked and accepted with little fanfare, but the NFF have also outlined a clear programme involving friendlies and sponsor activities. An agreement has been signed with the team, after due consultation with senior team players, on bonus payment structures and when they will be paid. As long as both sides, especially the NFF, keep to their end of the bargain and pay the players on time - and all indications are that they will - then Nigeria could enjoy a tournament free of financial rows. With all of the behind-the-scenes preparation well taken care of with 100 days to go until the World Cup, the attention turns to Gernot Rohr, who must choose a squad to represent Nigeria with distinction. So far, it appears the coach is already halfway there. The core of his squad is set in stone, with a starting eleven that - barring injury or a major loss of form - is largely predictable. However, these uncertainties will doubtless dominate the discussion between now and Nigeria's opener against Croatia on June 16. Goalkeeper is Rohr's biggest headache. Losing Carl Ikeme in the middle of the qualifiers proved a major setback, and so far, none of the trio of Ikechukwu Ezenwa, Daniel Akpeyi and Dele Ajiboye have got a grip on the number one spot. Such is the uncertainty, that the inexperienced Francis Uzoho - with 45 minutes of international football and a handful of La Liga appearances under his belt - is being considered in some quarters as a potential number one. While defence is a largely settled area for Rohr, he is only one injury or suspension away from a disastrous situation. Leon Balogun and William Troost-Ekong have formed a dependable partnership at centre-back, Shehu Abdullahi has excelled at right-back, while the much maligned Elderson Echiejile has shown consistency. Ola Aina and Brian Idowu represent competition at full-back, but elsewhere, strong support options are in short supply. Captain John Mikel Obi holds sway in midfield, supported by Ogenyi Onazi and Wilfred Ndidi, although Oghenekaro Etebo is making a case for a starting spot with some strong performances in La Liga after signing for Las Palmas. John Ogu is waiting in the wings, Anderson Esiti could also provide options, while the likes of Chidiebere Nwakali and Mikel Agu have been considered by Rohr in recent months. Nowhere else in the squad is competition more fierce than in attack, although despite the options, only Victor Moses has truly asserted himself as an undisputed start. Odion Ighalo, Alex Iwobi and Kelechi Iheanacho should travel despite their underwhelming seasons, while Ahmed Musa's move to CSKA Moscow gives him the opportunity to repay Rohr's faith to date. Moses Simon is a favourite of the coach, but it's too early to run out the prospects of a handful of offensive talents making a late run into the squad if they can find goalscoring form over the coming months. With 100 days to go, Nigeria appear well placed to flourish at the World Cup with preparation better than it has been in two decades. However, are these omens to be believed, or are they just calm before the inevitable storm?